Chris can perform an Airport Wedding in any Southern California airport. And he can issue you a CA confidential marriage license right there on the spot. On a layover in Los Angeles at Los Angeles airport? or John Wayne Airport, Orange County? or Long Beach airport? or Burbank airport? or Ontario airport? Want to get married here? No problem. Chris can perform a wedding ceremony in the terminal, in the parking structure, the baggage claim, a restaurant or anywhere near the airport which can be considered California destination weddings. If you get married anywhere in Southern California, then he can provide a Los Angeles County California wedding license which is valid anywhere in California and file it in person to the LA County Clerk Recorder for you so that you can continue on with your trip and everything is taken care of for you. Many couples choose to get married by Officiant Guy on a stopover because they don’t want the bureaucratic hassle of getting their marriage recognized by the United States government if they are traveling overseas, and they want their marriage to be confidential, which can only happen in California. It is not uncommon for Chris to officiate a wedding at the airport terminal. Since he has been the officiant for many airport weddings, he can suggest an interesting area in or around the airport. Officiant Guy can officiate weddings in any of the smaller airports in Southern California as well such as Santa Monica Airport, Compton Woodley Airport, Fullerton Airport, Hawthorne Municipal Airport, San Gabriel Valley Airport or El Monte Airport, Brackett Field Airport, Riverside Municipal Airport, Fallbrook Airpark, or McClellan-Palomar Airport. Officiant Guy has performed so many airport weddings that USA Today reported on the phenomenon in June 2008 and in the New York Times in July 2018. Click on Destination Weddings to read the online version excerpt. 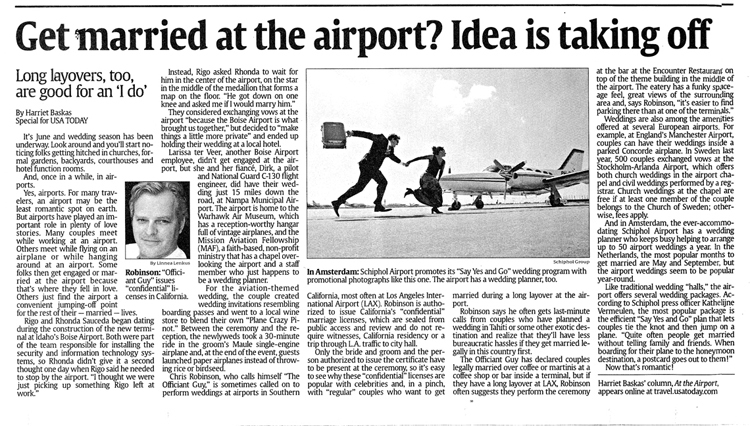 Click on Airport Marriage to see the hard copy of the article. Give Chris a call today to be your wedding officiant for your airport wedding. He is the best wedding officiant in Los Angeles County. Chris Robinson is a California marriage ceremony officiant. He has been marrying couples and providing Los Angeles confidential wedding licenses for over two decades. If you want to get married in Los Angeles County to Riverside County give the top ceremony officiant in Southern California a telephone call at (310) 882-5039 or (562) 547-3255 or fill out the contact form.